Ben Scheer jumps imagination-first into big projects, and he’s not afraid of a lot of trial and error. The human and organizational development and economics double major has worked on dozens of entrepreneurial endeavors that focus on solving problems through technology. “It’s really fun to explore all the opportunities that are out there to build and create solutions for people,” says Scheer, who’s part of the Curb Scholars Program in Creative Enterprise and Public Leadership. During his four years as an undergraduate, the Maryland native has helped lead the Vanderbilt Innovation Entrepreneurship Society, Vanderbilt Ventures and the new Vanderbilt Entrepreneurial Network, among others, earning him the 2018 Vanderbilt Student Changemaker Award. The link between most of Scheer’s projects is the opportunity to master some form of technology. “It was when I started at Vanderbilt that I realized you could really help people through technology, and if you want to make a worldwide impact from your dorm room, it could be through an app,” he says. As a first-year student, Scheer taught himself how to code and created an app called Spark Your Idea that was accepted into Apple’s App Store. The app encourages creative thinking through a technique that involves comparing random words and images of objects. He soon added a computer science minor through the School of Engineering to his academic program, and now he has several apps available in the store. His most successful app to date, however, isn’t designed for humans, but rather orangutans. Assistant Professor of Computer Science and Computer Engineering Maithilee Kunda connected Scheer with a project at the Atlanta Zoo to build an app to entertain and educate the apes. “I love animals, so I had to say yes to this opportunity,” Scheer says. The challenge was creating an app that the orangutans would enjoy using without receiving food rewards. Scheer took a leadership role on the project, recruiting a student from MIT to work on the app and collaborating closely with zookeepers to study the extensive technological constraints that had to be tackled. Meanwhile Scheer’s other projects have taken him into the realm of virtual reality design. He’s currently working with Nashville musicians to create VR experiences that complement their music. 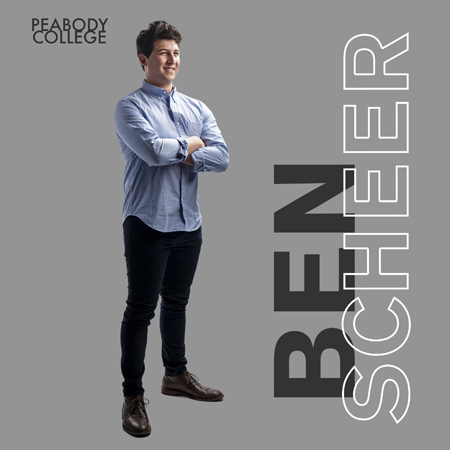 Scheer has accepted a job following graduation as a business technology analyst, which will enable him to explore helping people through technology in unique ways. He says the HOD major has been the perfect launching point for all his various interests.